If you’re looking for a way to up your game, a good gaming mouse can help you take your play to the next level. Even if you already have a gaming mouse, it can be good to upgrade from time to time, just like you upgrade your hard drive and your GPU. 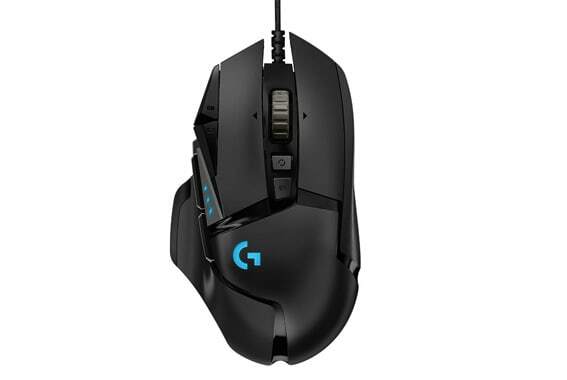 In this article, we’ll be taking a look at the Logitech G502 Hero. This puppy is loaded with features, from 11 customizable buttons to a 16,000 DPI sensor that puts the “fine” in “fine tuning”. That’s all great in theory, but how good is it actually? 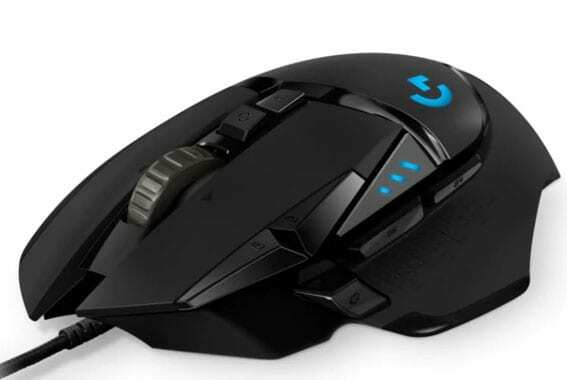 We’ve put the G502 Hero through its paces. Here’s what we found. 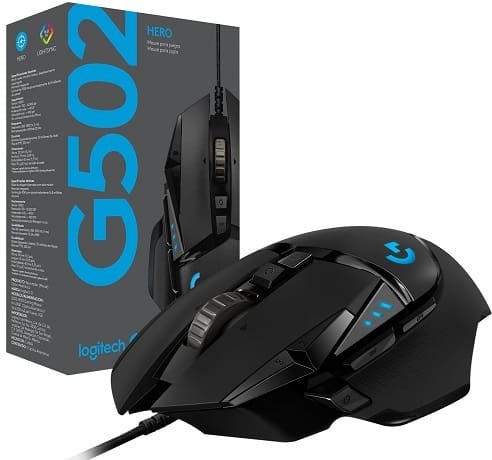 The G502 Hero is Logitech’s upgrade to the G502 Proteus Spectrum. 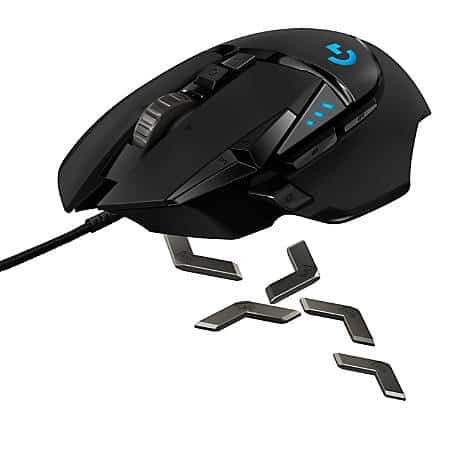 If you’re familiar with the Spectrum or the base G502, this mouse is very similar. However, there are two major differences which make the Hero an upgrade over its predecessor. First, the 16,000 DPI Hero optical sensor is a remarkable improvement over the older, 12,000 DPI Proteus sensor. In terms of numbers, this looks extremely impressive. It’s also in line with newer industry standards, so we understand why Logitech put this sensor out. That said, 16,000 DPI is extremely sensitive, and we can’t think of a case where someone would actually want that level of sensitivity. If you like it, go ahead and crank it up that high, but most gamers will be just fine setting their G502 Hero to 10,000 DPI or less. The Hero sensor does improve performance on white surfaces or light grey, which can be an improvement over the Proteus sensor for some users. You won’t see the second improvement listed on the box, but it’s arguably better than the upgraded sensor. The G502 Proteus Spectrum was an awesome mouse, but it suffered from some durability issues. The weave on the cord sheathing was coarse and loose and was prone to kinking. As you can see in this video, the new G502 Hero cord has a tighter weave and much finer threads that aren’t as prone to gapping or kinking. The USB plug on the Spectrum had a nicer grip, but overall the new cord is a major improvement. We’ve already talked about the insane DPI potential of this mouse. Now let’s talk about some of the other specifications. First off, this is a large mouse. It’s 5.2 inches long, 2.95 inches wide and 1.57 inches tall, so people with smaller hands might have some trouble using it. On the other hand, it pretty much has to be that big to accommodate all 11 buttons. 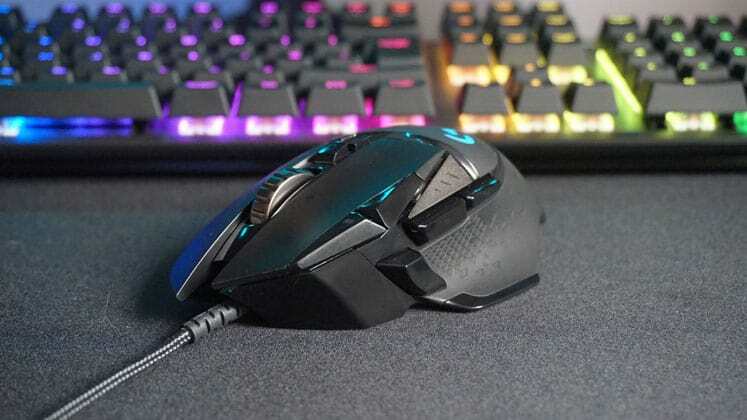 For such a big mouse, the G502 Hero is actually pretty light. Out of the box, it weighs 4.3 ounces or 121 grams. This is a bit on the heavy side, so Logitech compensated by letting users balance the weight of the mouse. They included 5 chevron-shaped, 3.6-gram weights. 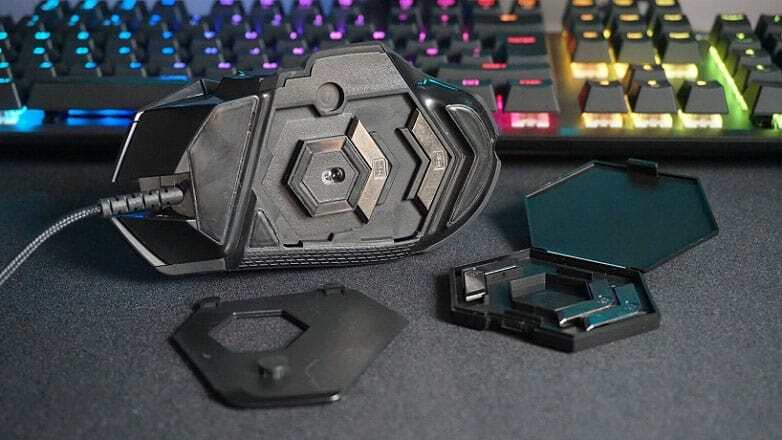 By pulling back the glossy tab under the thumb grip, you’ll reveal a series of magnetic slots in the bottom of the mouse. You can put any number of weights in any combination of slots, so you can radically change the weight and balance of your mouse. With all weights inserted, the G502 Hero weighs 139 grams or 4.9 ounces. The buttons on this mouse are tough. 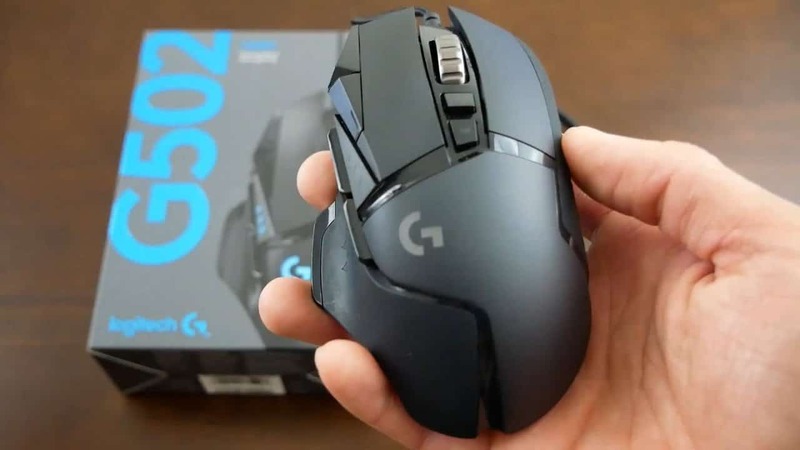 While the main left and right buttons on previous versions of the G502 have been rated for 20 million clicks, the Hero upped the ante by improving that to 50 million clicks. That’s 578 days of continuous clicking, or almost enough clicks to beat Dark Souls as a Deprived. Seriously, these buttons are durable. 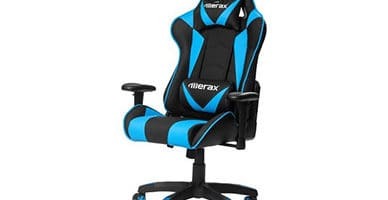 They feel beefy but still click easily with a relatively light touch. The thumb and pinky grips on this mouse are also really nice. They’re made from springy, textured rubber. If you’re like us and tend to get sweaty hands when a match gets really intense, these can keep you from fumbling your mouse. More than that, they’re comfortable, and we like comfortable. 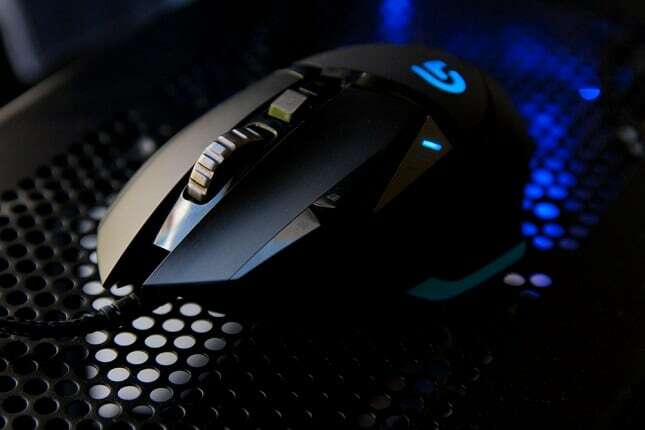 The G502 Hero was definitely made for people who play shooters. Two of the buttons are specifically made to improve performance in clutch situations, and both of these features bear mentioning. First is the sniper button, which has become a popular feature on newer gaming mice. The sniper button is located low on the inside of the mouse, right behind your thumb. Clicking it will instantly drop the mouse to the minimum sensitivity setting of 200 DPI. As the name implies, this is awesome for snipers. You can look through the scope, drop the DPI to make the steadiest possible shot, then click the button to reset the sensitivity as you lower your rifle. The other specialized button is the mechanical wheel lock button. This button clicks a metal ratchet against the mouse wheel, so it will only scroll one notch at a time unless you really force it. This is great for navigating inventory menus, or other scrolling menus that can fly past at light speed if you over-scroll the mouse. Clicking the lock button again restores the mouse wheel to its normal, free-scrolling mode. Having 11 buttons is pretty impressive. There aren’t a lot of mice on the market with that many. But what if you play several different games, and want several different presets so you don’t have to reconfigure your mouse every time you change games? 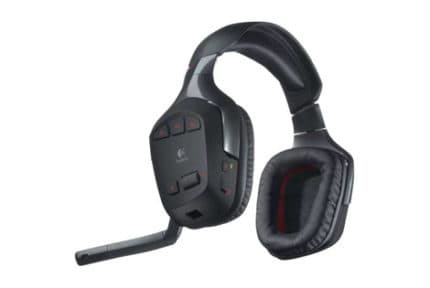 The G502 Hero supports up to five preset profiles and stores them in onboard memory. Once you’ve set up a preset profile, you don’t have to open any software to change your configuration. There’s a handy button on the side of the mouse that will do this for you. The lights on this mouse can be programmed to light up in 16 million different colors. If you have a favorite sports team, you can use their colors. Not only that, if you have a Logitech keyboard with customizable LEDs, you can set both of them to match. There’s another neat setting, and while it has no practical value, it’s worth mentioning. You can set your G502 Hero to light up the same color as whatever you’re mousing over. This may not win Logitech any awards for practicality, but it’s just plain cool. You can also set your Logitech keyboard to do the same thing, so your rig will constantly change color as you’re running across the map. The G502 Hero is a plug and play mouse on most modern computers. If you just want to plug it in and go, you can do that, but you’ll be missing out on some of the more advanced features. If you download Logitech’s Logitech Gaming Software, you can use it to configure the custom buttons, change the LED colors, and use the other customization features we talked about. Installing Logitech’s software only takes a few minutes, and will let you get the full benefit of your new mouse. Some users have reported that the right button is finicky out of the box. Specifically, it can stop working, particularly if you use third-party software to change some of the presets. We didn’t have this issue ourselves, but it’s something that’s out there. 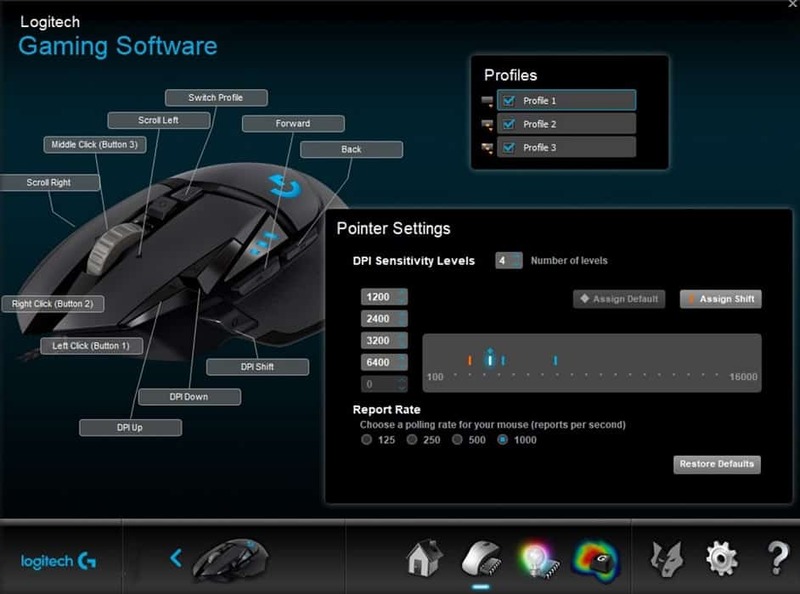 Apparently, using Logitech’s free Logitech Gaming Software to reconfigure the mouse solves the problem in most cases. This is yet another reason to use Logitech’s software instead of a third-party alternative. There have also been several reports of mouse buttons failing within a few months. That’s a bit disturbing, but Logitech has good customer service, and you’re bound to produce a few duds when you’re selling as many mice as Logitech is. Given the much larger number of positive reviews, this doesn’t look like a common issue. Finally, this isn’t an issue per se, but the G502 Hero has a cord. Logitech is a huge company that makes great products across a ton of product lines. Surely, they can make a mouse that takes batteries. On the other hand, if you’d rather deal with a cord than deal with batteries, this can be a huge plus. Depending on where you buy it, the G502 Hero will run you between $65 and $70, which isn’t bad for a newer model of a gaming mouse. You’ll end up paying more if you want a fancy special edition with a custom skin, but if you’re buying a special edition you expect that. If you’re looking for a top-of-the-line gaming mouse, it’s hard to find a better choice than the G502 Hero. It’s among the most sensitive mice on the market, and the 11 customizable buttons make it extremely versatile.